Counting how many fireballs the Beast can shoot. Counting how many ricochets one of the Beast's fireballs can make. Trying to figure out the scoring rate for boulder dashing. How do army members die? multiple hits / limited amount of kills? Checking the exact hit detection area for Colwyn. Counting the exact time cycles for the Hexagon wall color changes. Checking how long it takes to recover your Glaive from a bad Hexagon hit. Krull is an arcade game based off the 1983 movie, which, as fantasy movies go, was actually pretty good. The game's plot is loosely based on sequences from the movie. In the game, you are Colwyn, heir to the throne, and you are trying to rescue your beloved, Princess Lyssa, from the evil Beast and his Slayers. 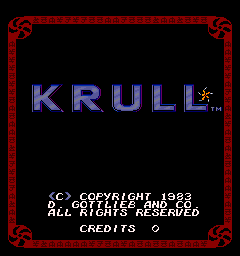 Krull is essentially a souped-up version of Robotron, with the same dual-joystick control scheme. The game is divided into five rounds, the first one weaponless (thus requiring only one joystick), and the next four using one control for movement, and the other for firing your weapon. In case you were wondering, 'Krull' is the name of the fantasy world where all the action takes place. Stage 1 - Collect the pieces of your weapon -- the Glaive. The REAL boulder dash! The five pieces of the Glaive are spread out across a mountain top. You have to grab each blade piece while avoiding the boulders rolling down the mountain. Be cautious around the trees on the mountain--they will slow you down as you pass through, unless they have previously been crushed by a boulder. Stage 2 - Rescue your army -- shoot the Slayers. You've recovered the Glaive; now it's time to build an army. Eight members of your army are scattered around a wasteland, and Slayers, nasty silver creatures that shoot electrical bolts, are popping up out of the ground everywhere. The Slayers are aptly named; they're equally happy killing you or your army mates. You can kill slayers by throwing your weapon at them. Your army members can also kill them by touching them, but will die if hit by a Slayer's bolt. Slayers can kill you by hitting you with a bolt or by touching you. 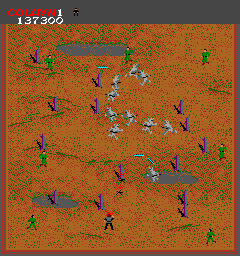 Rescue as many army men as you can--when all are rescued or dead, you must kill the remaining Slayers on the board. Be forewarned, some Slayers will begin to move faster and faster if you do not kill them immediately. Furthermore, the final Slayer will always move and fire at maximum speed. There are various dead trees that can impede you (you cannot pass through them) on this level, but they're a relatively minor factor. Stage 3 - Lead your army to the Hexagon. You've recovered your army, now you need to lead them to the Hexagon (some form of transportation? it's been too long since I saw the movie) Essentially, this stage plays the same as the Rescue stage--except your army and Slayers do not kill each other. Collect army members by touching them and then touch the Hexagon that floats around the arena to deposit your army into the Hexagon. You must collect all of your army to advance to the next stage, but you DON'T have to kill the Slayers at the end of the stage. This stage may play the same as the Rescue stage, but it's much, much harder. 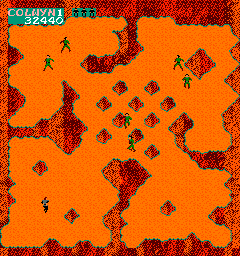 The screen is divided into four 'pocket' areas in each of the four corners, which are connected by a small patterned maze of rock formations in the middle of the screen, making shooting only possible in the middle area on a diagonal axis. It's also hard to pull off long range shots, so running through the middle to get to another pocket is a harrying experience, and where you're most likely to die in Krull. You can collect as many men as you want before touching the Hexagon, but if you die before dropping those men off, then you have to collect them all over again on your next life. Stage 4 - Break down the front wall of the Hexagon --when it is black. Your army is inside the Hexagon, and you're about to be attacked by Slayers. You need your army. The front of the Hexagon has four walls which will shift through different colors. When the wall turns black, you can destroy it. If you shoot through all four layers, you continue to the next stage (again, you won't have to kill all of the Slayers in this stage). If, however, you shoot the Hexagon wall when it is any color but black, your Glaive will stick to the wall and you will have one less Glaive for a number of seconds. All of this takes place while you are being attacked by Slayers, of course. Stage 5 - Rescue Princess Lyssa. Avoid the Beast. Avoid his fireballs. The endgame. The Beast starts in the middle of the screen, you start at the bottom, and Princess Lyssa is in a niche at the top. You need to get to the top. The Beast will be trying to stop you. The Beast throws fireballs at you which will rebound multiple times off of walls, making timing and aiming crucial in this stage. You can shoot down the fireballs with your Glaive, and you can stun the Beast by hitting him (he is always slowly moving towards you, throwing his fireballs). 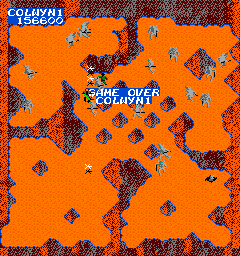 If you make it to Princess Lyssa, you chase away the Beast and score points for your surviving army members, before starting back at a harder, faster first Stage. Scoring: Running in front of a boulder (Stage 1) - #points/sec? The pieces are spread out in a triangle formation at the beginning of the level, so run up the right side, grabbing the first three pieces. 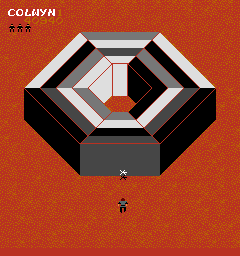 Then look for an opening in the rocks to move to the left side of the screen. Run down the mountain and grab the fourth piece. Now comes the fun part. On the first few passes through this level, you can leech about 20,000 points before the boulders start coming too fast to dodge. How? Simply run in front of a boulder that is moving the same speed or slower than you. You'll hear a low drumming sound telling you that you are scoring points if you do this correctly. 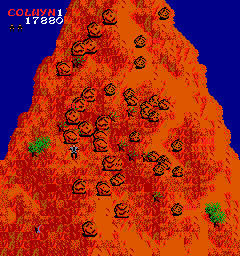 However, if you're killed by the boulder or another boulder, be aware that when you restart the level, the last blade piece will be at the top of the mountain. Still feel like leeching? Not a very good idea, esepecially since the boulders seem to speed up even faster this time, and if you don't move for that blade piece right away, you ain't gonna get it. Concentrate not on collecting your army, but rather on clearing a safe route through the Slayers to your army. Whether army members live or die is irrelevant--it's a win-win situation. If they live, you can score more points. If they die, you have less of them to bring to the Hexagon in the next, harder Stage. Adjust your gameplay accordingly. Remember that the last Slayer is going to be coming at you hot and heavy (though he may take a short while to accelerate, it won't be long), all guns firing. Try to strafe while firing for maximum coverage when there are 5+ Slayers left. When there are less than five Slayers, and they are more or less beelining for Colwyn, fire your Glaives and then use this beelining to your advantage--by moving Colwyn the proper direction, you can guide the Slayer straight into the path of your Glaive. A headache. The middle ground, in later stages particularly, is a deathtrap. Try to stay in one of the pockets and let your Army, enemies, and Hexagon come to you. Clear army members into the Hexagon at the earliest opportunity--having to recollect them if you die is painful and risky. Pray that the Hexagon doesn't get stuck in one of the other pockets. If it does, or if the level starts getting too fast, or if your #$%&! army members just will not cross over the middle, you're going to have to make a run for it. Shoot diagonally a number of times down the lane you're going to run, saving your last Glaive for any cross-throws you may have to make. Don't dawdle! You have virtually no room to dodge in the middle. This stage is all about making good risk-taking judgments. Easy if you don't screw up. The walls shift color at a decent rate, so as soon as you have the first wall out of the way, move up into the empty space created. This way you cannot be immediately attacked by Slayers appearing from the side of the Hexagon, meaning you only have to contend with those in front of you. You'll also be able to hit the next wall that much faster. 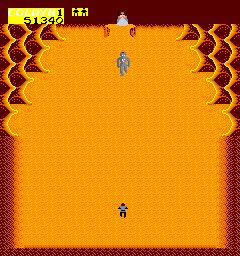 Avoid the temptation to throw at the Beast or his fireballs--this is almost a straight running stage. Run at the Beast, destroying only fireballs that come straight at you. When halfway to him, run at about a 30 degree angle past him, and when you are horizontally level to him, switch to a -30 degree angle and beeline for Lyssa. Fireballs will have ricocheted and be heading for your position by this point, so time your run to avoid them, not to shoot them. Shooting them gives the Beast extra time to launch new ones at you, and for other fireballs to home in on your position. You have 4 Glaives that can be on screen at once. If you've shot all 4, you have to wait for one to come back before you can fire again. Multiple Glaives can be fired on all stages, and they must always return to you. The Glaives are equally lethal on their way out as on their way back. Therefore, there are two obvious considerations: always keep a Glaive in reserve for emergencies, and use the path of the Glaive to take out enemies (paticularly useful at the end of Stage 2). Glaives will return to you as soon as they hit something, including enemies or landscape. You can, however, shoot through dying enemies (they're the spinning ones) to hit other enemies. Beware the later levels of the game. The field will start with Slayers on it, instead of clean like the first level. Slayers like to toss electricity bolts on the diagonal rather than the horizontal for some strange reason, to the point where they will rarely ever shoot horizontally or diagonally on Stage 3. So for Stage 3, you can almost always safely attack a Slayer from right angles. Almost. Colwyn's hit detection area seems to be limited from his feet to mid-upper chest. A bolt shot at your head is deemed to have missed. This is useful for those last-minute, split second "Where do I go" dodging decisions.